My mum had a unique style when it came to birthday cards and labels on presents. 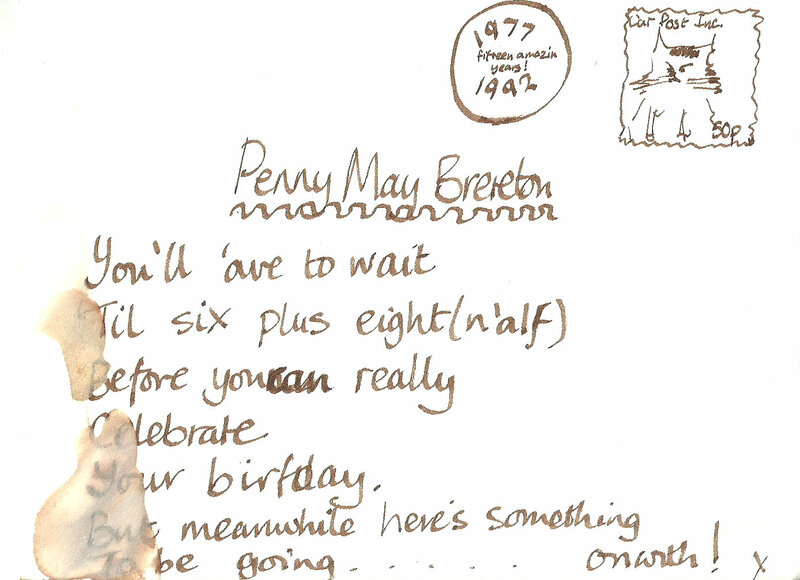 The envelopes were always mini works of art, with riddles and poetry. I’ve cursed myself for not keeping them all, but I found one unexpectedly recently, from my fifteenth birthday. ” ‘Til six plus eight (n’alf)” means 6+8 = 14, plus half an hour. 14.30hrs, the time of my birth. It took me a while to deciper that, mum was forever sending cryptic messages and texts. It was tough seeing a card without her cartoons and her name back in May. My brother is facing that this week. So big birthday hug and Happy Birthday little bro x Seeing this has reminded me that little gestures can go a very long way in making people feel special. Thanks to Kate at Skating on Thin Ice for the inspiration to focus on mum’s writing this week. Kate wrote a lovely post last week about rediscovering her mum’s cookery folder last week.